A leather chair is beautiful by itself. Pair it was a matching leather ottoman, and it the comfort level goes through the roof. Leather ottomans can be sturdy and classic or chic and minimalistic. They can have tufted tops, ornate feet or and shimmery nail heads. Regardless of style, a leather chair ottoman can be a welcomed addition to any living space. A leather chair ottoman adds more than style. It may be the most versatile furniture piece available anywhere. An ottoman can double as storage place, or as extra seating in a pinch. With the help of our expert design consultants, you can custom design and build the perfect leather chair ottoman for your decor. Stop by your local Bassett Furniture showroom and check out the fabulous new pieces in the Bassett line. Get inspired and when you’re ready, call your nearest store and make an appointment. 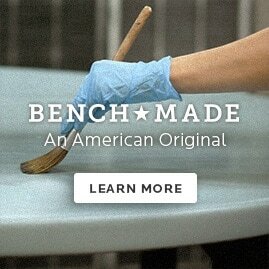 Together, we’ll create a custom furniture piece with your own personal flair and esthetic.